The benefit of using an online solution is that it can be used without installing software on a computer system. The software on the other hand offers the advantage of not needing an Internet connection to create the Power Point presentations. 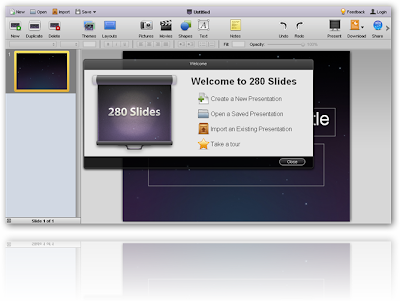 The 280 Slides website offers direct access to the presentation editor. All functions are free to use and require not registration except for saving presentations. Downloads are possible without registration and the service offers to create presentations in Microsoft Power Point 2003, Microsoft Power Point 2007, Open Office or Adobe PDF format. Presentations can be easily created. A wizard will be displayed at the beginning with the option to take a tour of the service or create a new presentation right away. Various templates are available including black and white backgrounds but also others that include gradients or a sky like template.